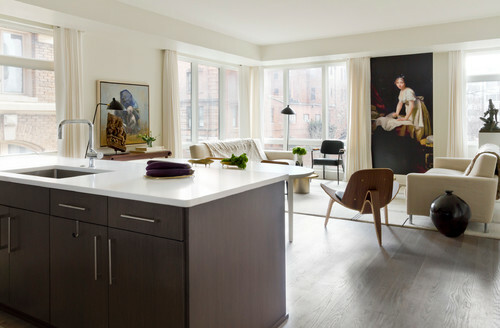 Designer Raji Radhakrishnan’s client had several requests for the design of her new apartment. The client spends most of the year traveling internationally and wanted to come home to a peaceful environment. She also has a diverse and wonderful collection of art, with many of the pieces from artists she has worked with. Also influencing the design was the fact that the contemporary apartment and building are on a street lined with diplomatic embassies and homes in the Beaux Arts Kalorama neighborhood of Washington D.C.
“It was very important to ensure that her art not only worked very well in this contemporary apartment, but also that each was highlighted beautifully,” Radhakrishnan says. Location: Kalorama neighborhood of Washington D.C. 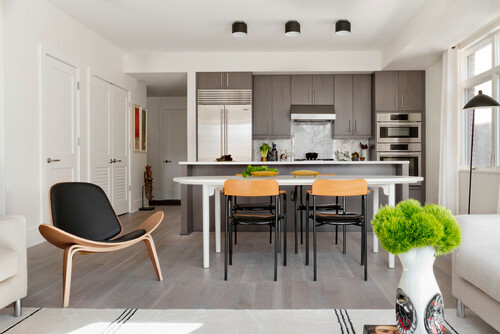 Designer Raji Radhakrishnan’s client lived in an apartment down the street from this one but decided to move when she saw the plans for the newly constructed building. “The great thing about this place is that since it is a brand-new home, it needed nothing more than a deft hand at the decorations, starting with the walls and ceiling colors,” Radhakrishnan says. The client gave her full rein over the selection of the furnishings, the layout and the colors. While the living, dining and kitchen areas are all in one large space, the seating arrangement creates an easy division among them. “In order to open up the living area to the beautiful views out the window, I placed two large vintage sofas to face each other, each with its own sculptural chair and cocktail table to create two separate seating areas — one for watching TV and the other to take in the views,” Radhakrishnan says. A large custom rug unifies the seating area. 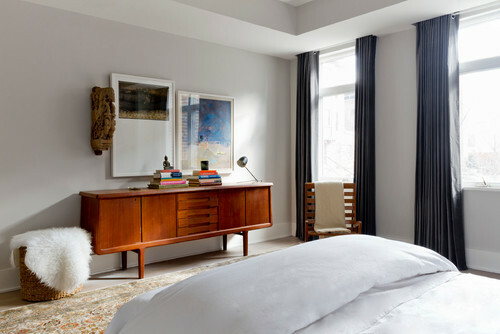 Since the homeowner travels extensively, the designer envisioned the home as a modern-day Christopher Columbus story, except this journey begins in Asia and continues through various countries via Europe until ending up in Washington. “The missing link was Europe, so in selecting both this mural as well as some of the furnishings, I looked to many parts of Europe and at decisively modern furnishings to complement the contemporary architecture, as well as tie in all her various art,” Radhakrishnan says. The mural was key in pulling the room together and was created from a photograph taken of an 18th-century French painting. “The portrait, with her soft gaze, was perfect for this wall,” the designer says. “I had decided at the beginning [it] would be a huge draw factor as you enter the apartment.” An antique sculpture of the goddess Uma is propped on a custom pedestal to the right of the mural. The dining area links the kitchen and living area. Radhakrishnan designed a custom white oval dining table, which can accommodate up to eight people. 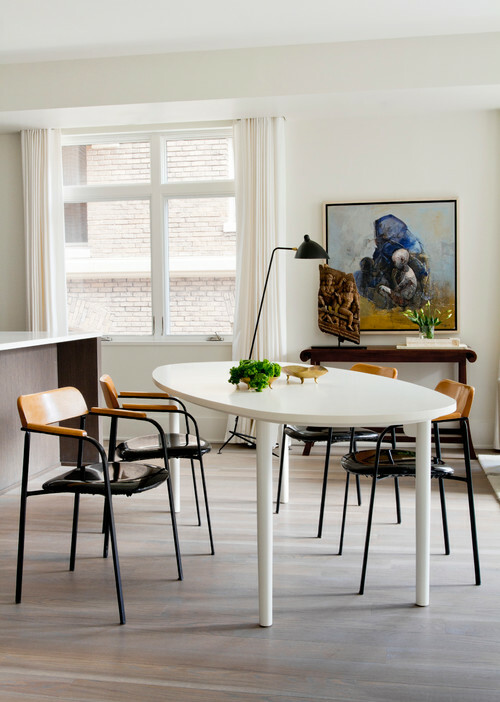 “Visually and aesthetically, it connects the living area and the kitchen without overwhelming the space, with its lightness and color, which also mimics the large kitchen island,” the designer says. The homeowner loves the table, as it can seat her entire family during the holidays yet is perfect for everyday use. 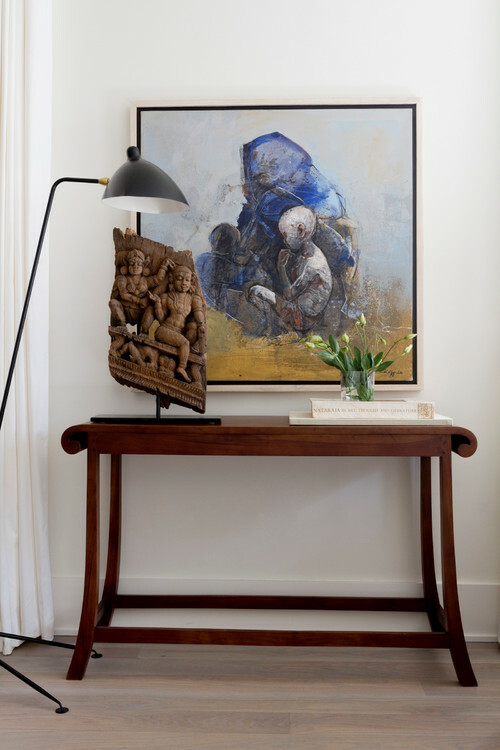 Beyond the dining table is a vignette composed of an original oil on canvas, the homeowner’s own console table and an antique Cambodian architectural fragment set on a plinth. Because the building was newly constructed, the kitchen required no work. The big island is ideal for spreading out and cooking meals. 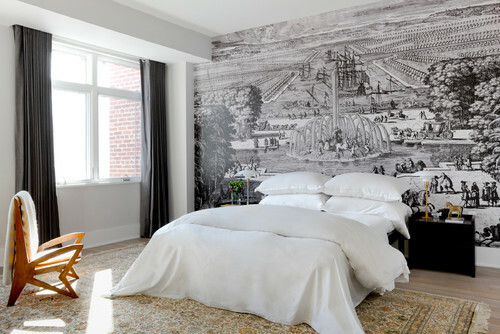 For the bedroom, Radhakrishnan had a mural made from a photograph of an etching of Apollo’s fountain in the gardens of Versailles. A vintage Agra rug and a chair by Charlotte Perriand from Maison et Toi complete the sanctuary. Displayed above the dresser is art the homeowner collected on her travels. Radhakrishnan had the pieces matted and re-framed to a larger size with simple white matting and frames often used in museums.